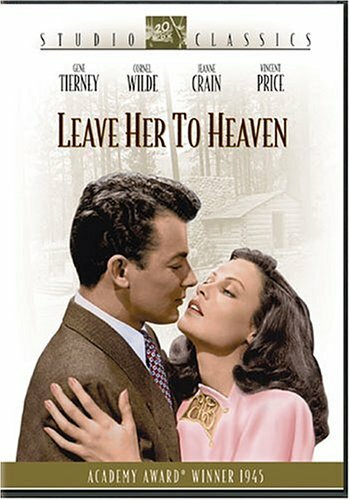 Twilight Time does it again with the release of the 1945 melodrama/film noir Leave Her to Heaven. I’ve had this on my TCM Top 12 since April, and I’m glad I waited for the Blu-ray release which lovingly preserves and enhances the three-strip Technicolor process. Leave Her to Heaven is far from perfect but its sudsy romance turned sour and discerning film noir elements build up a strong film held back by Code enforcement. Writer Richard Harland (Cornel Wilde) falls in love with beautiful socialite Ellen Berent (Gene Tierney). The two are quickly married, and Ellen’s obsessive need to cater to Richard’s every whim puts friends and family on the outside. As Ellen starts to believe that she’s losing Richard, she’ll do whatever possible to keep him for herself. For a “woman’s picture” – at the time – there’s an excellent blend of melodrama and film noir within Leave Her to Heaven. The performances are constrained and overtly formal, but they’re delineated into good and evil, focus on a man blindly following a woman down the wrong path (said woman being our femme fatale) and is told in voice-over (the lawyer detailing how it “all went wrong”); all symbols of a typical film noir. Sure, it becomes laughably ridiculous that Gene Tierney is in full makeup wherever she is, including swimming and waking up in the morning, but it works to erect a world where the beautiful sheen masks a cold and psychopathic truth. Essayist Julie Kirgo writes in the accompanying booklet included with the Blu-ray, that there’s a “baroque grandeur” within the film and it’s true. The set design and costuming form a world where everyone is hiding secrets, but they can still be gorgeous while doing so. The emotions run high thanks to a score by Alfred Newman that builds a dichotomy between the restrained interiors of the Berent’s house and the wild exteriors of the New Mexico landscape where we open the film. When we first meet the characters, Ellen goes out into the wilderness to dump her father’s ashes. As she wildly rides a horse the music becomes a thunderous cacophony of drums to emphasize her emotions running wild – possibly her heart beating wildly due to her Electra complex – which is tempered by the tinny, conversational piano music that Ruth (Jeanne Crain) plays when everyone is inside and their emotions are under control. 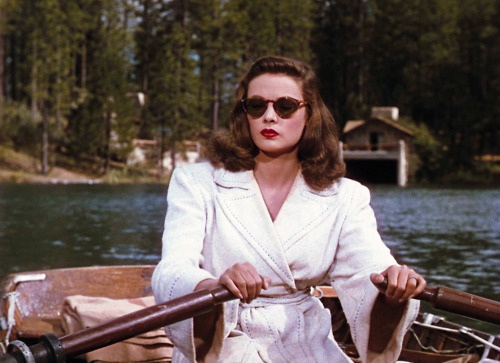 Leave Her to Heaven is an incredibly multi-layered film controlled by Gene Tierney in her best role, so far; I need to rewatch Laura so that might change. Tierney is beyond gorgeous, and yet her ice-blue eyes and dark hair belie a personality that you can’t pinpoint right away. It’s obvious she’s acting, but what for? When she first meets Richard on the train, it’s as if she drops her book and feigns sleep on purpose in order to get his attention. The cool snob works to Tierney’s advantage here in a way it didn’t in past films (such as The Return of Frank James) since the movie is focusing on the lures of the wealthy; it’s different from the films where her wealth was a source of comic relief, mostly due to her wanting to “rise above” being the poor rich girl and failing. There are certain sequences where you fear Tierney, like when she describes the fun of shooting turkeys or her manicured way of setting herself up to fall down a flight of stairs to bring on a miscarriage. Ellen does present cracks in the façade, but even then you question whether these are moments where Ellen wants you to see them as cracks; case in point, the moment when she calls Richard’s little brother Danny (Darryl Hickman) a “cripple” in front of the doctor. Tierney was nominated (for the first and last time) for an Oscar for the role but lost out to Joan Crawford in Mildred Pierce. Just imagine Rita Hayworth, who was offered the role of Ellen, and it wouldn’t work. It’s appropriate that Tierney and Crawford fought for the Oscar as 1945 seemed to be the year of women fighting for their families and losing a piece of themselves in the process. I’ve discussed the role of family and women in Mildred Pierce when I reviewed that film, but Leave Her to Heaven has a few threads that intertwine in terms of the presentation of women. The war had just ended when this was released and women were being told to return to the home after working to support themselves. Ellen is an example of an obsessive wealthy woman who believes money and glamour should give her everything; she offers to support Richard on her trust fund, removing his need (as a man) to work and live off her, and becomes jealous when she doesn’t get what she wants. The way I took it is the fear of what happens when a woman returns to the home after tasting independence. Ellen wants to remove Richard’s masculinity by telling him not to work, and refuses to conform to societal norms such as procreating – fearing that a baby will take Richard away from her. Of course, you also have the male fantasy of a woman willing to do anything and everything, including murder, in order to keep her man. Ellen’s Electra complex is immense here, and I was surprised at how incestuous the film becomes. Her relationship with Richard starts because of his resemblance to her father, and her need to care for Richard stems from a similar caring relationship with her father; it’s creepy, to say the least. As the film ramps up to the third act, I found myself feeling for Ellen more than Richard or Ruth. Don’t misunderstand me, Ellen is one of the coldest characters in film, allowing a boy to drown in front of her as well as hurling herself down a flight of stairs to kill her baby, but her husband doesn’t make it easier. He fails to understand Ellen’s growing claustrophobia, living in a small house where everyone can hear her. She wants to be with her husband, and yet she can’t because the couple share a wall with whoever is staying in the house. There’s a romance that ends up forming between Ruth and Richard where I found myself hating the duo and embracing Ellen. Ruth is the girl next door who’s not afraid to get her hands dirty in the garden – the garden being a sign of her nurturing personality. Ellen is aware of the growing friendship between the two, and when Richard dedicates his book to Ruth – something that attorney Russell Quinton (Vincent Price) makes note of as weird – you understand that the two are in love. Richard instantly became unlikable to me, and while the movie wants you to believe that Ruth’s love and Richard’s leaving of Ellen are separate, they coincide enough to have you believe one wouldn’t happen without the other. Cornel Wilde and Jeanne Crain are the happy couple, and don’t have nearly the grist of Gene Tierney. Crain doesn’t play the naïve girl like she did in Apartment for Peggy. Ruth is a character that understands men only deal with her to get to Ellen, but other than that Crain plays the role sickening sweet, and the tidy ending (demanded by the Production Code) doesn’t help to create a character that’s anything more than the girl next door. Wilde is good, but I confused him with Dana Andrews upon first glance. He’s the everyman, and nothing more. I was surprised to see Vincent Price in another Twilight Time release (after The Song of Bernadette), and he turns in a dashing performance as Russell Quinton, a former beau of Ellen’s. His screentime is lacking, but upon introduction he appears drawn and wan as if Ellen has sucked the life out of him with her love; an ominous precursor of things to come. His role is expanded in the courtroom sequences of the third act, where I was agreeing and hoping Ruth would be condemned, simply because the evidence proving otherwise was shoddy. While it’s funny that the jury took the word of Ruth’s lover as proof of innocence, it does give the dark film a happy ending. As for the Blu-ray, the Technicolor presentation is glorious. I was taken aback that it wasn’t the garish, bright colors you usually see in Technicolor productions; it’s muted, and deep which gives the character an unreal, mannequin quality to go along with the theme of appearances being deceiving. In terms of bonus content you have Alfred Newman’s thrilling score as an isolated feature; there’s a commentary – carried over from a previous DVD release – featuring historian Richard Schickel and actor Darryl Hickman. The two recorded separately, but each brings a unique perspective (one historical and the other personal) to the film that’s worth a listen. There’s also a two-minute MovieTone segment discussing the première and the film’s trailer. Leave Her to Heaven is another fantastic addition to your Blu-ray collection courtesy of Twilight Time. It does melodrama well without resorting to overacting to gets its point across, and the script is a mosaic of themes that showcase the various issues cropping up during the time period; Gene Tierney is a stand-out alongside Vincent Price. The Blu-ray presentation is crisp and the features are worth a look. I agree with you that Gene Tierney is at her (disturbing) best here, although Laura usually gets more acclaim. But both are great films and deserve to be recognized no matter in what order they might appear on one’s personal favorites list. Thanks for the great article and I’ll have to check out the Blu-ray! I hope to have a review of Laura up soon because I’m on the fence on whether Tierney is a pretty face or not (I’m leaning towards she’s more than that). If you get the Blu please let me know what you think! I didn’t care for it. I like Douglas Sirk’s melodramas, but this one directed by John M. Stahl is just too too plasticy for my taste. Only so much gee! golly! and gosh! I can handle 🙂 Probably worked okay in the 40s. The analysis that I’m looking for is why, after a gruesome war, did Hollywood decide that the public needed to absorb more horrors from the big screen. I don’t know if this movie is the first exercise in psychopathic horror, but from 1946, it must be one of the first. My sidewalk analysis harkens to the Roman empire, that in its bloated invincibility undertook the twisted avocation of feeding Christians to the lions. What’s with humans that after achieving Pax, their entertainments have to sink so sordidly? I’ve never thought about that, but honestly I’d explore it more as a response to women after the War. Women returning to the domestic fear after getting a taste of independence. What type of women were men coming home to; in the case of Leave Her to Heaven, the females might be more demented than the men who have experienced the horrors of war.